← When it comes to stress…. Lately, I’ve taken a strong interest in…. Lately I’ve taken a strong interest in meditation to escape stress and feel more relaxed. From the medical sources I’ve read, I’m convinced it has a lot going for it. If you’re depressed or anxiety prone, meditation may be more helpful than Zoloft or Valium and the like. In his book, When Panic Strikes, noted psychiatrist David Burns, argues that the new research isn’t gung-ho anymore on the assumption of chemical imbalance in the brain, resulting in serotonin deficiency. What success SSRI’s seem to have may really be the placebo effect in action. Control groups in which placebos have been given have shown virtually the same results. Of course, this is bad news for the pharmaceuticals, who keep pumping out their propaganda across the media and offering perks to physicians. Alas, there are even those in the FDA who have had strong links with the drug companies. One thing we do know: while meds can be necessary for many, they all have potential side-effects that can do great harm. Burns eschews the psych meds, favoring the cognitive approach with its advocacy of getting rid of emotional distress by adopting alternative, more positive thoughts in handling stress. It takes work to reprogram your responses, but it can be done. Cognitive therapy now dominates counseling, replacing traditional talk therapy. I agree that it can be helpful. In the hard scenarios, something more is needed. (Here I’m writing about anxiety, not depression.) That something may well be meditation. In the last several months I’ve been trying out what’s called restorative yoga, which consists of simple breathing, visualization, and meditation exercises. I’m not a champ at this kind of endeavor. I can’t even say I’ve got the breath thing down right. Books and videos can help, but ultimately, at least initially, you need a good teacher. Clumsy as I may be, I know that when I retreat to my sunroom hideaway, unroll my mat, and lie down, beginning with breathing from the stomach up through the nose, four seconds in, six seconds out, I sense my body unwinding from its tightness. I follow with body visualization, letting each limb “fall through” into the mat. Then I transport myself mentally into bliss, a scene that brings pleasure. 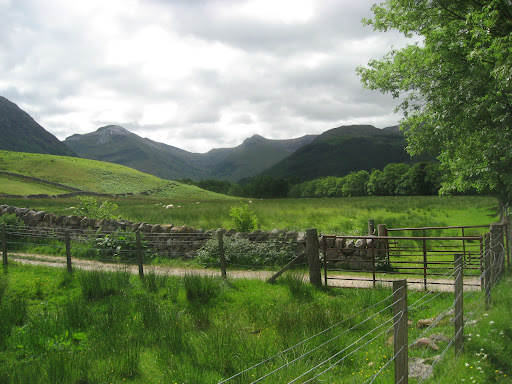 For me, it’s usually my wife and I walking up the steep, narrow pathway of rugged Ben Nevis, the valley below a dense green, splattered by the white wooly sheep grazing contentedly in a rolling landscape fenced by stone walls. I am there again in Scotland, that dear country of green mountains, twisting by-ways, lakes and bubbling brooks, and friendly people. I am at peace. I follow with actual meditation, or at least the attempt, with the aid of my mantra, the psalmist’s “lead me by the still waters,” emptying the mind, though it keeps insisting it’s the boss. Whatever my failed attempts, I feel relaxed. Recently I was virtually mesmerized in reading Tim Park’s Teach Us to Sit Still: A Skeptic’s Search for Health and Healing. He could have been writing about me. Both of us have been profs, working with language and literature. Both of us are into the mind thing, analytical and suspicious, reserved in our allegiances. Both of us were raised in a religious context, which we’ve now abandoned. Both of us have suffered the same physical ailment with its ubiquitous fall out, always there, seemingly beyond remedy. Parks, in his desperation, suspends his cerebral dissonance, to try meditation. It comes hard. It’s all about breathing. Though the mind resists emptying, Parks knows there’s something to it. He attends a five day retreat. On the fourth day, it happens. He feels the breath flow across his upper lip. Heat radiates through his body. And the pain? There is no pain. Of course the conscious world will bring back the pain with its culminating anxiety. You’re not there in a day. But Parks knows now, though he may not understand it fully, that mind isn’t separate from the body. The mind and body are one. The seed has been sown and Parks persists, each attempt in overcoming the chattering mind becoming easier. Parks finds his way ultimately to permanent relief from his physical pain. Nonetheless, as a rationalist, he still finds it paradoxical, He’s a writer with twenty books published, and on one occasion, short-listed for the Booker Award, Britain’s highest award for literary achievement. Words, after all, not only give him employ, they are the essence of what make us human. And yet there is that world beyond words, vast and ineffable, removed from the mind’s ceaseless chatter, bringing us in to touch with our full selves. Integrated, mind and body become amalgam, and reconciliation grants equanimity. No longer two selves, in our found wholeness comes peace transcending time and space, circumstance and pain. Teach us to be still.